“What I want is not antagonism. We go into a dialogue, we go for means that will make them aware because it is the people in the barangays who are suffering,” the bishop told local media in a press conference held Saturday at the Park Way Hotel, where he was the guest speaker of the first activity organized by the Surigao Media Forum, a loose organization of media practitioners in the city. Surigao del Norte is under the jurisdiction of the Diocese of Surigao. Surigao del Sur, which is under the Diocese of Tandag, on the other hand, is more vocal in its campaign against mining operations in that province and in the whole of Caraga Region, the region being the hub of mining operations in the country with 28 operating companies. Tandag Bishop Nereo Odchimar and the Social Action Center (SAC) of the Diocese of Tandag have been in the forefront in the anti-mining campaign. Cabahog said the diocese’s position on the issue has always been on “responsible mining”, the same position that the Catholic Bishops Conference of the Philippines (CBCP) took since several years ago. 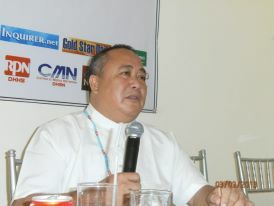 “The CBCP is not anti-mining per se but for responsible mining,” he noted. He added that part of his advocacy work is to directly communicate with concerned agencies in Manila on the effects of mining in the province. “If we will just bring it up here, nothing is resolved, so we just go directly to Manila,” he stressed. He said there are “different realities” in the two provinces, citing that Surigao del Sur has been historically strongly opposing mining. The Diocese of Surigao has been silent in several high-profile mining issues, including during the October 4, 2011 raid by the New People’s Army at Claver because of labor issues in mining companies and massive environmental degradation. But Cabahog, who is also a Canon lawyer, is taking the tact of peaceful negotiations, saying he had been communicating with the national agencies on what he sees in his sorties around the province. Recently, a group of anti-mining groups from Cantilan, Surigao del Sur came to visit the bishop for a dialogue purposely to get his support on the group’s call to implement a two-year temporary environment protection order (TEPO) against Marcventures Mining and Development Corporation (MMDC). Asked what agreements were reached, Cabahog said he has expressed his support but qualified that he is still waiting for the document that will resolve the issue on the subject. Meanwhile, the Surigao bishop admitted that mining companies in his area of jurisdiction have not been responsible in fulfilling their duties as “stewards” of the areas that they mine. It is just unfortunate that some provisions of the law are not being followed by the mining companies, Cabahog lamented. “Hopefully mining companies will have the social responsibility to restore the [destroyed] resources that they leave behind,” Cabahog said. He spoke of the global experience where mining companies operate but once they leave, the areas end up barren and wasted. He said the church will continue to work on its advocacy on the effects of mining and will not hesitate to call the attention of government if it finds the grievances of the people left unheard.